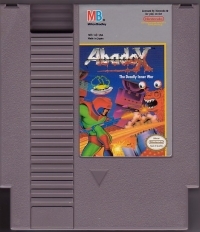 Box Text: Your home planet of Abadox has been swallowed whole by the deadliest menace in space! Its name: Parasitis. Its prey: All surrounding life forms. Its goal: To feed on the entire Universe! You are Second Lieutenant Naxal, the only surviving warrior of the World Alive Force. Parasitis has crushed The Force's attack ships and consumed a hospital ship -- with the beautiful Princess Maria still on board! Your mission: Blast your way inside Parasitis' gruesome body and battle your way to its Core. Hurry! Princess Maria may still be alive! Hurtle down Parasitis' throat, blast through its cellular walls! Fend off vicious, bloodthirsty organisms with guided missiles and lasers in Six Stages of Internal Combat! Kill each Stage's guardian monsters so you can reach the Core! Destroy Parasitis, rescue Princess Maria and save the Universe. 08-05-2016 edomaden Box Text Your home planet of Abadox has been swallowed whole by the deadliest menace in space! Its name: Parasitis. Its prey: All surrounding life forms. Its goal: To feed on the entire Universe! You are Second Lieutenant Naxal, the only surviving warrior of the World Alive Force. Parasitis has crushed The Force's attack ships and consumed a hospital ship -- with the beautiful Princess Maria still on board! Your mission: Blast your way inside Parasitis' gruesome body and battle your way to its Core. Hurry! Princess Maria may still be alive! Hurtle down Parasitis' throat, blast through its cellular walls! Fend off vicious, bloodthirsty organisms with guided missiles and lasers in Six Stages of Internal Combat! Kill each Stage's guardian monsters so you can reach the Core! Destroy Parasitis, rescue Princess Maria and save the Universe. 11-17-2012 exonerator Box Text Your home planet of Abadox has been swallowed whole by the deadliest menace in space! Its name: Parasitis. Its prey: All surrounding life forms. Its goal: To feed on the entire Universe! You are Second Lieutenant Naxal, the only surviving warrior of the World Alive Force. Parasitis has crushed The Force's attack ships and consumed a hospital ship -- with the beautiful Princess Maria still on board! Your mission: Blast your way inside Parasitis' gruesome body and battle your way to its Core. Hurry! Princess Maria may still be alive! Hurtle down Parasitis' throat, blast through its cellular walls! Fend off vicious, bloodthirsty organisms with guided missiles and lasers in Six Stages of Internal Combat! Kill each Stage's guardian monsters so you can reach the Core! Destroy Parasitis, rescue Princess Maria and save the Universe. 12-27-2011 matt Box Text This is just a test. You should see this line break. 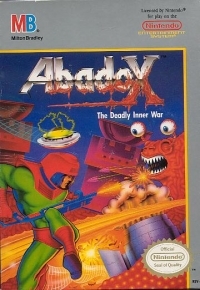 This is a list of VGCollect users who have Abadox: The Deadly Inner War in their Collection. 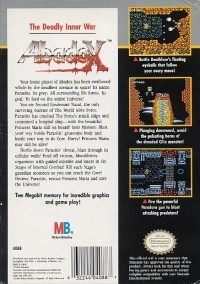 This is a list of VGCollect users who have Abadox: The Deadly Inner War in their Sell List. This is a list of VGCollect users who have Abadox: The Deadly Inner War in their Wish List.